Wouldn’t really smell either but … would still insulate better than any human-made insulation. Nature really knows her stuff! We had many a messenger deliver us questions from citizens throughout the GTA Territory when they discovered our plans to use straw bales to build Kitchenland. Are you not concerned about mold and mildew? The answers to these questions posed, while not simple, are still very positive. Now as you know mice here in the Kingdom of High Park are much more focused on finding food than helping sew a ball-gown or dance and sing with a princess. Fortunately for Kitchenland … they will find no food in these here straw bales. Straw is the waste material from cereal grains. Once the grain is removed the stalks, alas, are nothing but garbage. Some of this waste material is used for animal bedding but much is burned adding pollution and particulates to our air. 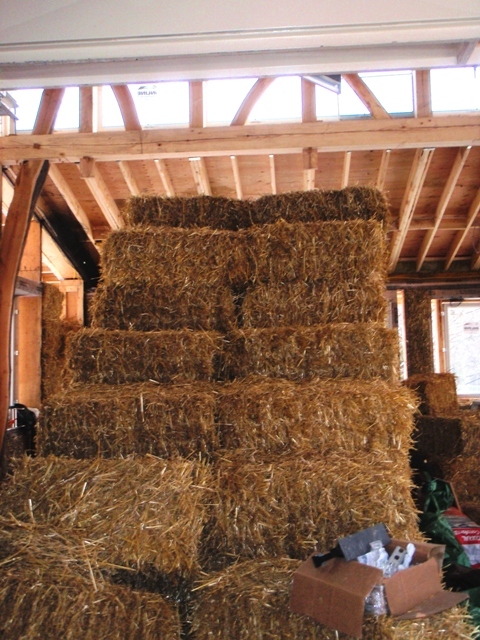 Using straw bales to construct homes and buildings is an excellent way to reuse such waste material. Click here for some very cool photos of wheat growing at a CSA (community shared agriculture) in Vancouver. Once straw bales are packed into walls (or stacked into walls) the straw is too dense to make a happy home for all but the most determined of little creatures. It’s also a great fire deterrent as there’s very little oxygen available to spread any flames. Adding 2.5 cm of cement-lime plaster on the inside and outside of the walls also keeps the critters and flames at a serious disadvantage! 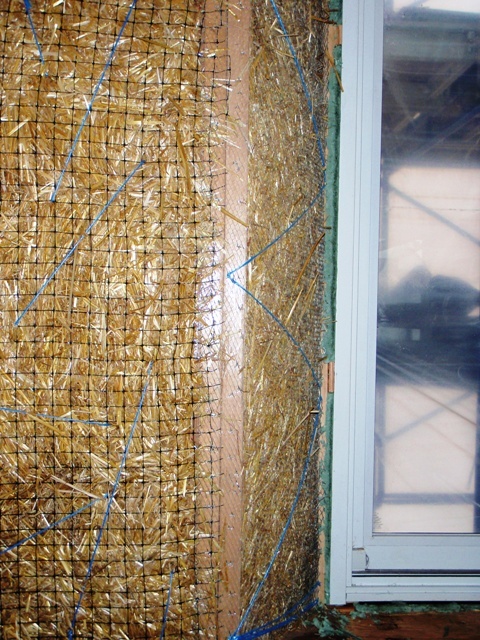 Keeping your straw dry and out of the rain while building is key to having healthy walls! 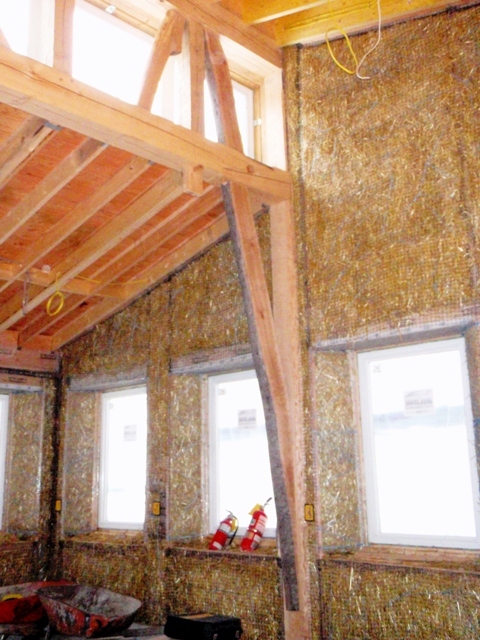 What’s most interesting with the straw bale and plaster walls is that air and water vapour can pass through the bales and plaster allowing them to “breathe” and keep the moisture level under control. This makes it an uphill battle for mould and mildew to take hold. As for how long Kitchenland will last … much longer than many of the buildings Kitchenland’s court attendants have held office within! 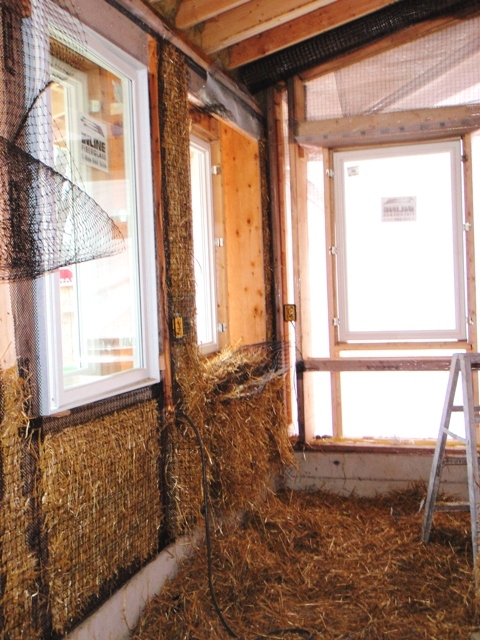 There are a number of straw bale buildings over 100 years old in Nebraska and many more across the country of a fair age. Kitchenland is beautifully constructed in a manner that will last for hundreds of years to come! 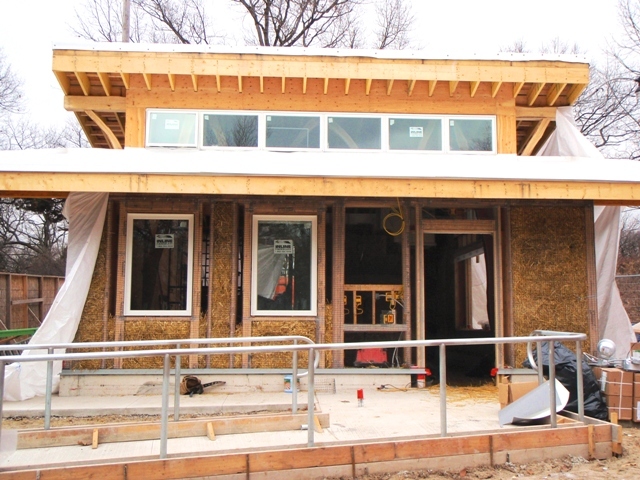 To that end our windows, donated by Inline Fiberglass, had to be installed before the fine folks from Harvest Homes could begin to stuff! They are beautifully crafted and should last for many years to come too! 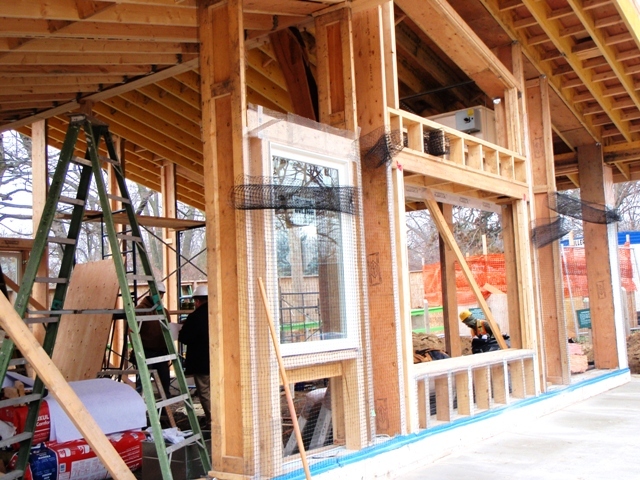 Installing the windows first makes shaping and plastering the walls much easier. 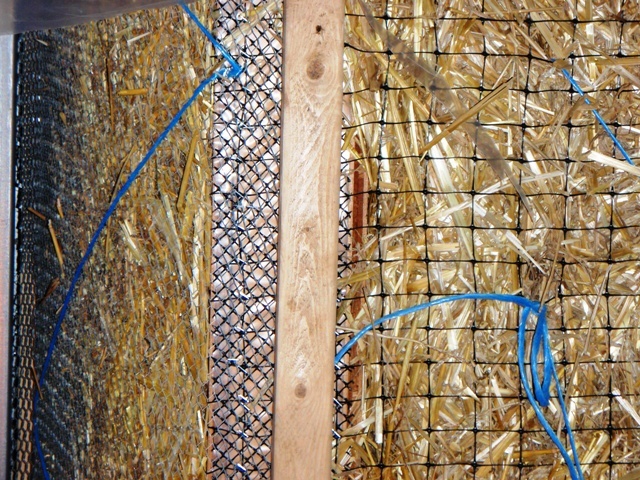 The next step was to put up the mesh to hold in the straw bales and tightly packed loose straw (in the places too small for a bale). 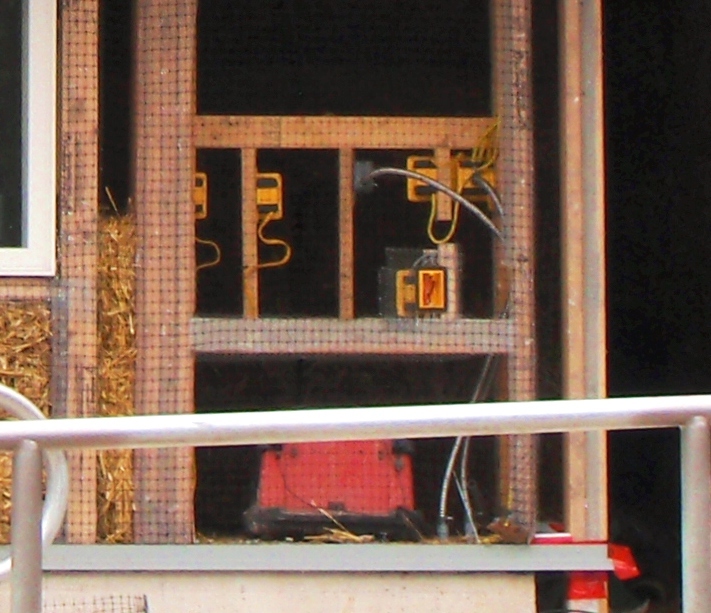 Electrical boxes similar to those one would normally use are attached to beams and cross braces and then the wiring is run along the beams. Sorry no shots of the royal weed-whacker in action! With everything trimmed up a little sewing is necessary to keep things neat and tidy. This makes it easier to plaster later on. Alas no fairytale mice were available at the time of construction to help with the sewing! Some bales are also shortened and sewn together to fit into smaller places. The lovely rounded edges of the window frames are aided by a little wire mesh (the main mesh used for the walls is a plastic). Such beautiful straw walls to complement our majestic roof truss. Kitchenland has become a cosy and quiet place. 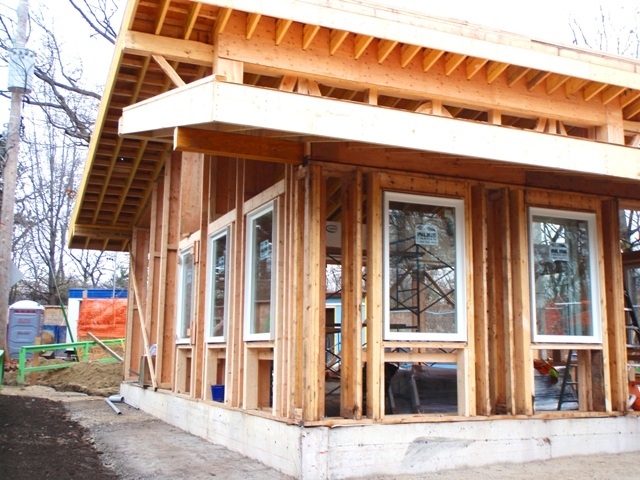 Perfect for contemplating the many veggie feasts the High Park Kingdom will soon enjoy! Now that the straw is complete the next step, in the stairway to Kitchenland, is the Plastering of our walls!